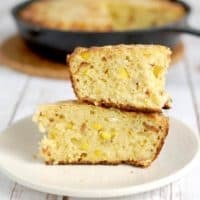 Smoked Corn Bread? Yep, you can bake on the grill. 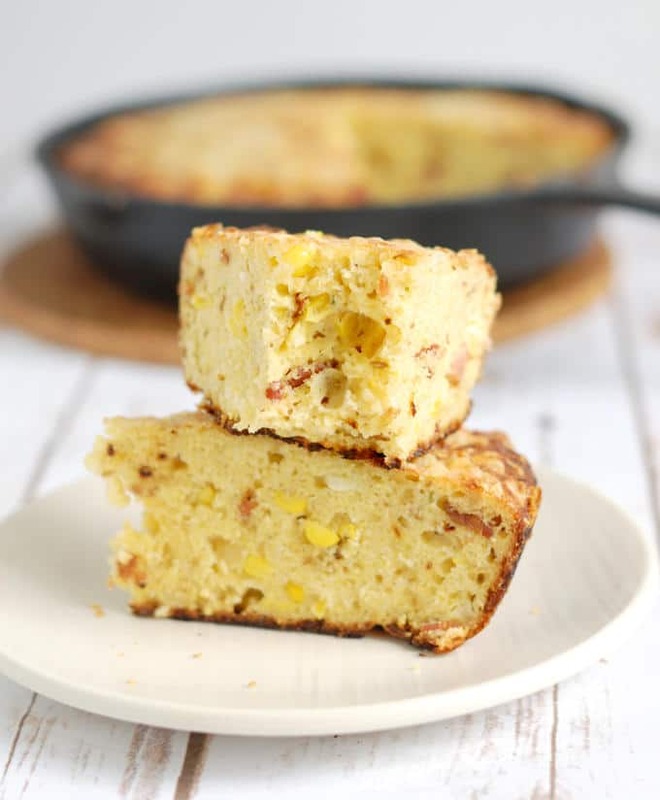 Chock full of bacon, corn, chipotle peppers and cheddar, Smoked Corn Bread has a super crunchy crust, lightly smoky flavor and is really very easy to make. Disclaimer: I have received products from sponsor companies to use in my recipes. All opinions and recipes are mine. Welcome to day 2 of #Cookoutweek! 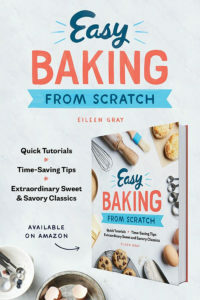 I’m so happy to share this fun recipe with you. Thanks to Smokin O’s for sending me three packages of their wood grill rings to play with. At our house we have both a charcoal and a gas grill. I love the smoky flavor from the charcoal and love the convenience of the gas grill. 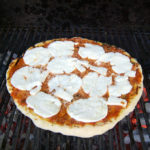 For weekend dinners we’ll usually take the time to light the charcoals, but for a quick weeknight dinner we use the gas grill. I was excited to try Smokin O’s on the gas grill. When deciding on a recipe I immediately challenged myself to actually bake right on the grill. 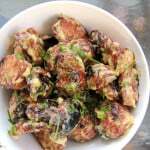 I needed a recipe that was sturdy enough to take the heat of the grill and would be enhanced by the smoke flavor. So I turned to one of my favorites, corn bread. 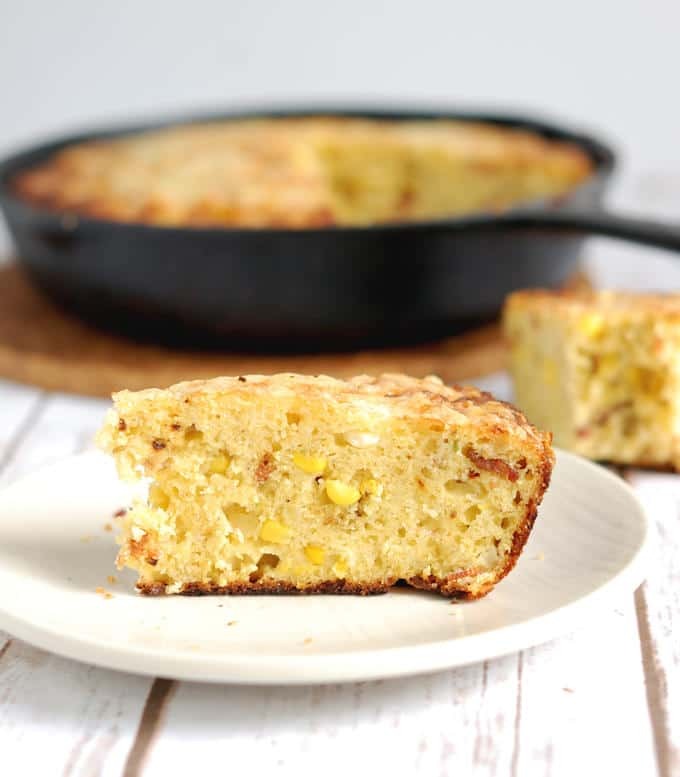 Corn bread can be light and sweet, or savory and hearty. 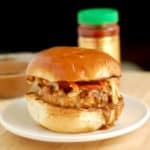 Because I wanted to emphasize the smoky flavor, I went the savory and hearty route with this recipe. 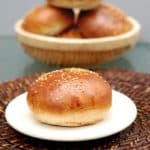 This bread would be perfect served along-side smoked ribs, pulled pork or grilled fish. I employed my trusty cast-iron skillet because I knew it could take the heat of the grill. I ended up using three wood rings since the bread was on the grill for about 25-30 minutes. I found that if I preheated the grill with one ring, then added another ring when I put the pan on the grill, and then a third half way through baking I had consistent smoke the entire time. Our grill is fairly large, so I imagine if you have a smaller grill surface that 1 or 2 rings would be enough. 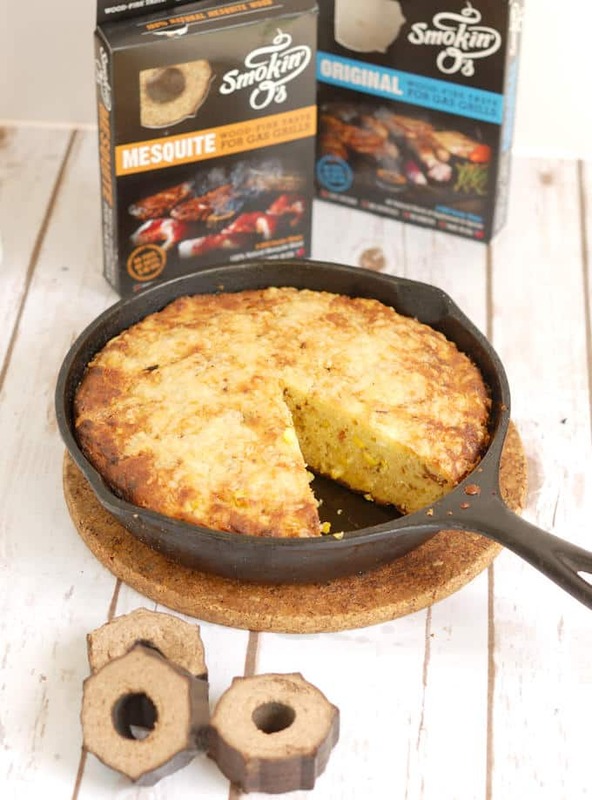 Watch the recipe video to see how to bake Smoked Corn Bread on the grill. You can bake on the grill. 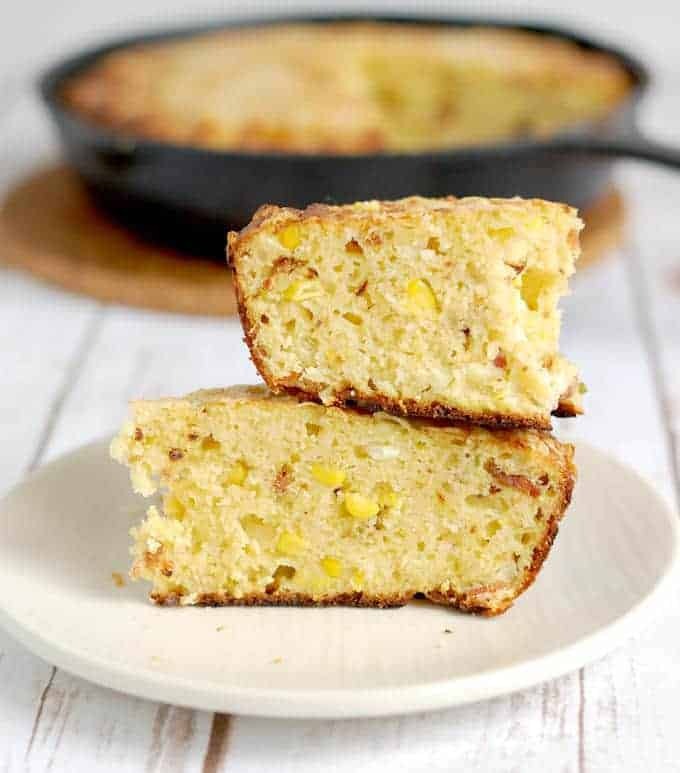 Chock full of bacon, corn, chipotle peppers and cheddar, Smoked Corn Bread has a super crunchy crust, lightly smoky flavor and is really very easy to make. In a large mixing bowl, whisk together the flour, corn meal, salt, baking soda, sugar and cumin. 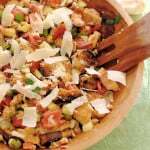 Add the minced chipotle, corn, scallions and bacon and mix. Toss in 4 oz of the shredded cheese. Whisk together the buttermilk and eggs. Pour the reserved bacon fat into a 9" cast iron skillet. Swirl the fat to coat the pan. Pour the fat from the pan into the buttermilk mixture, whisk to combine. Add the buttermilk to the dry ingredients and mix until combined. Pour the batter into the skillet and spread with a small spatula. Top the batter with the remaining 1 oz of shredded cheese. Bake the bread on the warm side of the grill until it is golden brown and a toothpick inserted in the center comes out clean, about 25 minutes. Monitor the heat of the grill so it doesn't go much above 450°-500°F. If the grill is getting too hot move the pan to the cool side for a few minutes. It's best still warm but will keep several days at room temperature. 1. You can either use a chipotle in adobo or a dried chipotle pepper. Soften the dried pepper in boiling water before mincing. 2. You can also make a smoking packet by wrapping soaked wood chips in foil. Cut slits in the packet and heat up on the grill until the chips are smoking. We also have a fabulous giveaway featuring products from the brands who have made #CookoutWeek possible! You can enter below to win. As one of the bonus entries in the giveaway, leave a comment on this blog post… what’s the most unusual dish you’ve ever made on the grill? 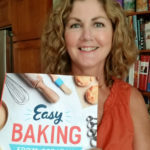 Previous Post: « Welcome to #Cookoutweek 2017 & a Giveaway! Very creative use of the product. Good job.